Press release from Tops Day Nurseries. Tops Day Nurseries, based at 1000 Lakeside Business Park in Cosham has collaborated with Boogie Mites and Hillsea Lodge Care Home to bring the young and old together. There has been a rise in the press showing the benefits of children visiting care homes, to both the residents and the children themselves. Residents often report high levels of loneliness and care home staff note an increase in their mood, health and interactivity after visits. The nursery has been regularly visiting the care home, and the children enjoy the time spent with their elderly friends. 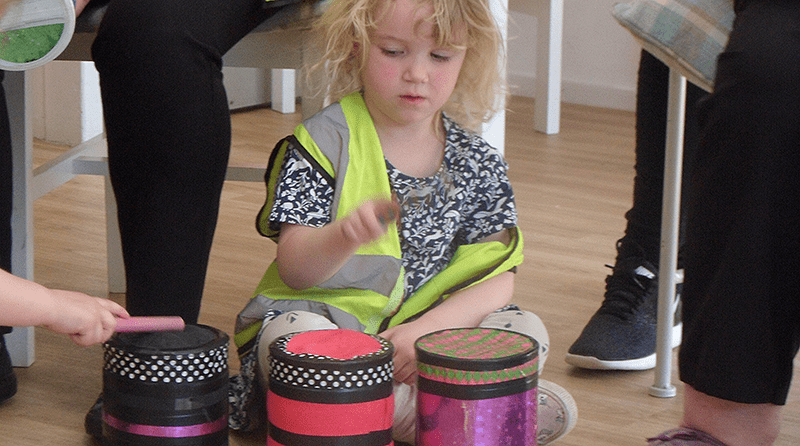 Recently, Tops Day Nurseries introduced the lively music and movements of Boogie Mites, a fun, educational dance and music activity as part of an intergenerational music 6 week course. Barbara Chaitoff, Nursery Manager at Tops Lakeside said, “We take the children to Hillsea because we believe it has benefitting factors on both our children and the elderly in care. The children walk in and the residents’ faces light up with excitement! During the visits, children learn about the differences between generations and about the world they live in. They understand that sometimes they need to speak quietly, but sometimes it is necessary to speak more loudly if an older person is having difficulty hearing them. A study will be conducted during these visits to evaluate the impact of intergenerational sessions. Sue Newman of Boogie Mites UK said “Boogie Mites would like to thank Tops Day Nurseries for contributing to and participating in a study to evaluate the impact of intergenerational music making sessions. The study will evaluate the impact on wellbeing and community cohesion of 4 courses being held across a 6 week period in Portsmouth. Tops Day Lakeside Nursery will walk a group of children to the council run Hillsea Lodge care-home on Monday afternoons for a Boogie Mites music and movement session with a group of the care-home residents. A trial visit earlier this year was enjoyed by everyone involved. Tops Day Nurseries is a national award winning early years provider with 28 Good or Outstanding nurseries across the South. They are pioneers and leaders of quality in the early years sector with the Managing Director, Cheryl Hadland, named as the “Most Influential Person in Childcare 2018.